Switching Basics and Intermediate Routing CCNA 3 Labs and Study Guide The only authorized Labs and Study Guide for the Cisco Networking Academy Program Allan Johnson Switching Basics and Intermediate Routing CCNA 3 Labs and Study Guide supplements version 3.1.1 of the Cisco? Networking Academy? Program CCNA? 3 course. This guide maximizes your understanding of: Advanced IP addressing techniques, including variable-length subnet mask (VLSM) Routing protocols, including RIPv2, OSPF, and EIGRP Switching technologies and LAN design Switch configuration, including port security, Spanning Tree Protocol (STP), VLANs, and VLAN Trunking Protocol (VTP) Each chapter contains a Study Guide section and a Lab Exercises section. Keep all your completed work on hand in this book to study from later, or take advantage of the perforated pages to tear out and hand in specific material for homework assignments. Study Guide The 90 exercises in this book help you learn the concepts and configurations crucial to your success as a CCNA exam candidate. Each chapter is slightly different and includes some or all of the following types of exercises: Vocabulary matching and completion Skill-building activities and scenarios Configuration scenarios Concept questions Journal entries Internet research Lab Exercises The Lab Exercises sections begin with a Command Reference exercise to help you review all the commands covered in the chapter. The book includes all 32 labs from the online course, with an additional 10 labs in which you can apply your knowledge about the technologies and concepts introduced. Youll get ample opportunity for hands-on practice in three different types of labs: Curriculum Labs are step-by-step exercises designed to introduce you to new concepts. Presented with detailed instructions and sometimes additional explanations for completing the lab, the Curriculum Labs come directly from the CCNA 3 online course. Comprehensive Labs combine the concepts learned from the course and Curriculum Labs into new experiments. These exercises provide minimal guidance. You are encouraged to complete the Curriculum Labs before moving on to a Comprehensive Lab. Challenge Labs require a thorough understanding of the previously learned network concepts. You should complete all Curriculum and Comprehensive Labs in a chapter before attempting a Challenge Lab. Additionally, the appendix includes three CCNA 3 Skills-Based Assessment practice labs. After completing all the exercises and hands-on labs in this book, you will be well prepared to continue your networking education in the CCNA courses that follow. 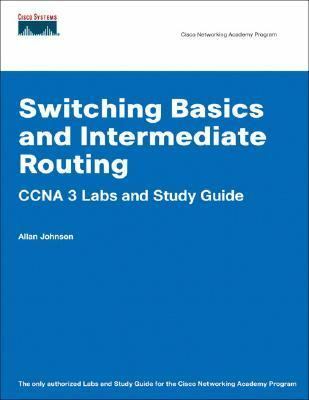 Use this book with: Switching Basics and Intermediate Routing CCNA 3 Companion Guide ISBN: 1-58713-170-6 Allan Johnson is an information technology instructor at Mary Carroll High School and Del Mar College in Corpus Christi, Texas. Since 2003, Allan has committed much of his time and energy to the CCNA Instructional Support team, providing services for instructors worldwide and creating training materials. He is a familiar voice on the Cisco Networking Academy Community forum, Ask the Experts series. This book is part of the Cisco Networking Academy Program Series from Cisco Press'. The products in this series support and complement the Cisco Networking Academy Program online curriculum.Johnson, Allan is the author of 'Switching Basics And Intermediate Routing Ccna 3 Labs And Study Guide ', published 2006 under ISBN 9781587131714 and ISBN 1587131714. Loading marketplace prices 18 copies from $0.17 How does the rental process work?